When faced with a crisis, the pain, fear or questions aren’t always from the immediate matter at hand. Occasionally, there are side-effects. When dealing with diabetes, the fear is not necessarily produced by thinking about how high my blood glucose reading might be right now, rather, the fear is that over time, I will suffer neuropathy, lose a limb, go blind. The other fear, is that I may suffer a low in the night and not wake up. These aren’t overt fears that I think about all day long. . but they do brew, back in the recesses of my mind. So, now. . .breast cancer. My fear isn’t about chemo, radiation, surgery, losing one of my lovely lady-lumps (thank you Fergie) My fear, really, is that our Egypt plans may be put on hold or changed. I fear that I will cause pain and sadness for my family. I fear that my grandchildren. . whenever they arrive. . will not know me and know how I anticipated the day I could hear their little voices on the phone. ALL of this is future driven. . none of it is about today or tomorrow. My God. . and He has never been more MY GOD than these last few weeks. . has a plan for me and reminded me today in so many ways that He is in control. . He will take care of the calendar, the beginnings and endings of my days. We were checking in at the imaging center. I didn’t even see this tri-fold calendar placed just inches from my arm. It was one of those calendars given away as a promotional item. 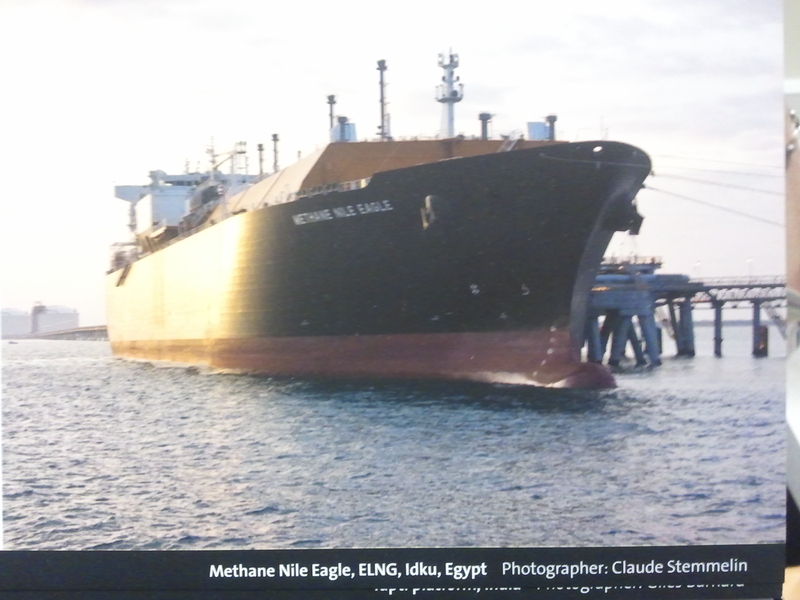 The picture was that of a large ship named, Methane Nile Eagle. . home port? Egypt. Ok really. . this was the desk of a 50ish woman with a picture of an Egytpian ship sitting on her desk in a very pink-decorated breast-cancer aware environment. This screamed. . YOU ARE GOING TO EGYPT. I cried. . of course, because that’s what I do. We asked about it and the calendar is from her son’s company. She never really looks at the calendar itself, but keeps it out because it reminds her of him. But to me. . it reminded me of HIM, who calls me His own. Psalm 56:2b-4a: O Most High, when I am afraid, I put my trust in you. In God, whose word I praise, in God I trust; I am not afraid. How’s that for this frightened beyond belief woman? Now the word of the Lord came to me saying, ‘Before I formed you in the womb I knew you, and before you were born I consecrated you; I appointed you a prophet. . for you shall go to all to whom I send you, and you shall speak whatever I command you. And how’s that for that girl wondering about her future? I think sometimes we get so busy trying to figure things out, planning, being afraid, that we forget to stop and recognize God’s hand in our lives. I almost missed the picture of the ship. . even with my arm resting against it. I was so busy worrying about the events of the day. . I hadn’t read my devotional this morning. I’m also glad He uses others, in this case my DH, to point out those fingerprints when we get too busy to look for ourselves. If you’re not seeing fingerprints in your life. . maybe there’s someone who can play a little spiritual CSI and help you dust for prints. Maybe you’ve seen them and you’ve just passed them by. Maybe you’ve washed them away because you don’t want to see them. I am forever grateful for a God who is intimately involved in my life. He feels my pain and cries with me. He rejoices over me and sings songs of joy. Most of all. . He sees ME. Wow, Barb. I think that last paragraph should be made into a song or a poem or something. It has very insightful thoughts. You have a great gift for writing. You are expressing thougts that many can relate to and know they are normal. You inspire hope for those in pain.